True fans of Ariana Grande know all about her and donuts and this t-shirt will give her lots of donuts to lick. The t-shirt is completely covered in donuts and yes that does mean both the front and the back and even the sleeves. And on top of those sweet donuts, you can see Ariana Grande in a black outfit and some high boots. The whole design of the shirt is cool and that makes it the perfect shirt for anyone that likes Ariana or donuts. You can get this Ariana Grande and donuts t-shirt in sizes XSmall – 2XL and it is a unisex t-shirt so that both men and women can enjoy having one. If you want an Ariana Grande mug for your morning coffee then this is what you need. 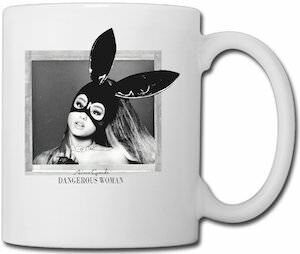 The white mug is made from high-quality ceramics and on it you can find a black and white picture of the album cover of the Dangerous Woman album from Ariana Grande. This mug is 11 oz and is dishwasher and microwave safe so that you are sure that this special Ariana Grande mug will be with you for a long time. Tea, coffee, or any other beverage of choice this ceramic mug can hold it all. If you have seen the video of the Ariana Grande song Focus then this t-shirt looks familiar. On the shirt you can see one of the scene’s from the Focus video clip in witch you can see Ariana sit in a tube with light behind it. Yes with that look she definitely is the focus of anyone who looks at it. You can get this Ariana Grande t-shirt in men and women’s styles. It is also available in many fun colors and sizes so that all the true fans men or women can enjoy wearing a Focus t-shirt like this. If you ever wanted to know when holidays and moon cycles are, this calendar is what you are looking for, oh and that you are a fan of Ariana Grande! This calendar features 12 different photos of Ariana Grande including her on stage, at a photo shoot and even some selfie pictures. The cover is a beautiful black and white picture of her sitting on a stool with high heels and her hair up in a sleek ponytail. This calendar comes with large blocks for every day of the week to give you the space to keep track of your special and important appointments. It features July to December 2015 planner pages and of course all the months for 2016. Arianator’s of the world! Now there is a t-shirt that can express your true loyalty in being the number one fan of Ariana Grande! It straight out tells the world that you are an Arianator! You know the things in life that make things worthwhile, and that “like attracts like”, when you are declaring your connection with you favorite star, you are becoming closer to her in essence. Ariana Grande stands for being heard, humanitarian endeavors, equal rights, being empowered, acknowledging strong women, making great art, and knowing how to have fun! She can sing like nobodies business – that incredible vocal range and power, mastered so early in hear career! No wonder you want to have her on your t-shirt! Well, now you can, and this is the perfect one! This gorgeous t-shirt is available in unisex sizes Small – XL on a 100% comfy cotton t-shirt, shipped to you fast! She stole your heart from an early age on Nickelodeon and now becoming a beautiful woman. Use your appreciation to protect your iPhone right now! It’s a black and white picture of Ariana Grande in a beautiful pose showing off her long hair and flawless skin. There is pink cursive “Yours Truly” and bold Ariana Grande. It is a nice way to decorate your iPhone and protect it at the same time. The protection of your phone begins with yours truly and ends with Ariana Grande. Ariana Grande is quickly become a celebrity after starting her career on broadway and then as an actress for the Nickelodeon series Victorious as Cat Valentine. Her debut music album from 2013 “Yours Truly” from Republic Records hit #1 on the Billboard top 200 chart. This album by Ariana Grande titled “My Everything” has the chart topping song “Problem (Featuring Iggy Azelea)” also found on this awesome album is “Why Try”, “Break Free”, Best Mistake” and many other classic Ariana songs. It is available as an audio CD or MP3 download, it is the perfect sophmore album following up her chart topping first album titled “Yours Truly”. Ariana Grande sticker? Yes please! If you are a big fan, then your next piece to add to your collection should be this sticker. It is so great! This sticker is a unique sticker. It has Ariana Grande in a pink dress with some great orange colored pumps. She is looking back and you can see the great zipper element of her dress. On one side of her is Ariana and on the other side has Grande, they are both written in great font in the same pink as her dress. This is a die cut sticker that is made of vinyl that is waterproof and can be used outside for up to 18 months. It’s ideal for any flat surface that you can think of. Just make sure you get this sticker today, so you can be the first for the unique Ariana Grande picture to stick anywhere. Ariana Grande can sweep you away in a lovely Vanity License Plate. If you are a big fan, you will surely want to have this license plate to display with pride. The Vanity License Plate features a very colorful picture of a surprised looking Ariana Grande with a blue sky background and her side profile looking into the distance with some great pink lipstick. The license plate measures 12 inches long and 6 inches wide. It is made of aluminum that is durable and strong, it is water resistant which helps to keep the image looking great for a long time. Put the Surprised Ariana Grande Vanity License Plate where ever you want. On the front of your car, on your desk, in a locker or on the wall. It’s your choice, but it doesn’t matter because it will look great!